These splendid pieces from our Sheffield collection will make a great addition to your décor space and will make a defining statement in fashion sense and comfortability. 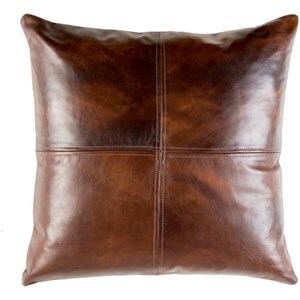 These pieces are made from 100% pure leather and a 100% polyester filling in India. These should be spot cleaned only. The Sheffield 8665 x 19 x 4 Pillow by Surya at Hudson's Furniture in the Tampa, St Petersburg, Orlando, Ormond Beach & Sarasota Florida area. Product availability may vary. Contact us for the most current availability on this product. Browse other items in the Sheffield collection from Hudson's Furniture in the Tampa, St Petersburg, Orlando, Ormond Beach & Sarasota Florida area.